Don’t let ‘Domain Renewal Group’ fool you! To be quite honest, I am not too fond of paper. I take all notes in digital format, either on my cell phone, or via plain ol’ notepad on my laptop. I don’t even own a printer anymore. That said, I typically don’t get much in the mail, either. Except for a Guitar Center advertisement, which I’m fine with. 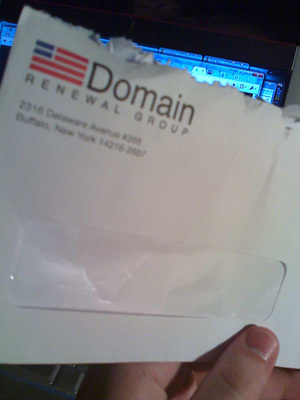 Opening up the letter, I saw exactly what I had intended to see: a letter telling me that my domain is expiring soon and that I should transfer it to them. For a nice fee, of course! Now, why do I title this about mail like this fooling you? 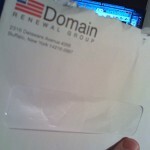 It’s simple: this is not from your domain name registrar! The appearance of their letter, though, makes it look like a bill requiring payment or else you will lose your domain (though they say that it isn’t a bill in the letter). But, the appearance could fool you, right? That’s the intention. That is an example of something called domain slamming. All I ask is that you read the contents of the letter before making a decision! 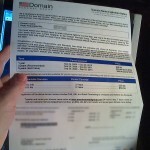 You can typically find cheaper domain name providers, which may include the current one you are using. Their site copyright is through 2007. Have they not touched their site in over a year, possibly even two? This is only the second time I’ve received such a letter in the mail. However, what kind of people are they targeting? 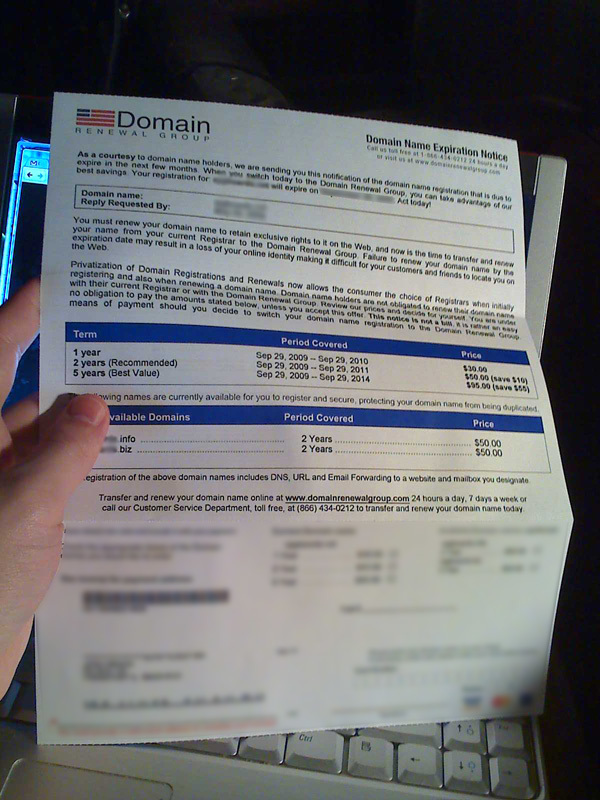 If you’re knowledgeable about your hosting provider and domain registrar, then you would probably not want to just change all that based on a letter in the mail telling you that your domain name is expiring. So, really, like with anything, the best defense you have is to be well informed. In this case, so long as you know who you host your site with and who manages your domain name, then you should be safe. Side note: While I felt that this post should be used to inform people and give a ‘warning’, I decided not to use the words scam or fraud. Given that such letters have been able to continue for years, it must still still qualify as legal. However, given the ethical concerns of such a process of domain slamming, I felt I’d just give some information that can, hopefully, make the reader more informed about what a letter like this involves.